So here we are, at the end of the Europe ski season 2014/15. Although it is late March already, we just had up to 20 cm of fresh snow in the Alps and we’re not done yet. More snow is expected in the next few days, so it definitely makes sense to take that week off and go skiing that last time this spring. Livigno, Ponte di Legno, Passo Tonale are among ski resorts expecting a dump pretty soon. These resorts plus the popular resorts of Val di Sole and Madonna di Campiglio offer the always popular Free Ski deals. Free Ski deal works as follows: you book your accommodation and the ski passes are free. That makes that April ski holiday so much more affordable. Let’s have a look at some of the options we have for you. Starting this Saturday we have a free ski pass for you if you book Acero Rosso Apartment in Ponte di Legno. These apartments offer free wi-fi, central location and easy access to ski lifts which take you to 100 km of pistes (30 km in Ponte di Legno and 70 km more in Passo Tonale – lift-connected). All ski runs in Ponte di Legno – Temu and Passo Tonale are open with snow base of up to 4,2 meters at the top of the Presena Glacier. Book one of our apartments from just €270 per person per week including ski passes. 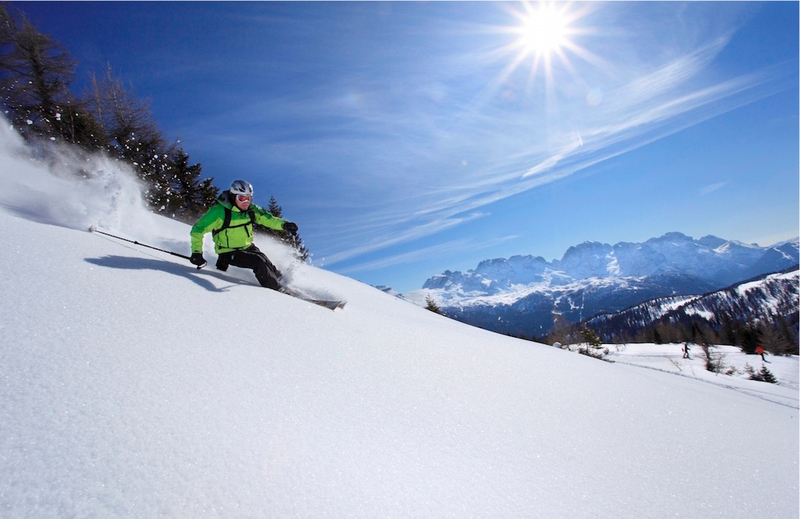 If you’re after a more renowned ski resort you can still book a ski holiday in Madonna di Campiglio-Pinzolo area. We have a very nice Casavacanze Sporting in Pinzolo-Carisolo available. These, too, are self-catered apartments only 750 metres from the lifts. Recent connection of Pinzolo and Madonna di Campiglio skiing areas by the new cable-car provides you with access to 150 km of ski runs of: Pinzolo (30 km), Madonna di Campiglio (70 km) and Folgarida-Marilleva (53 km), with all pistes open and nearly 2 metres of sno at the top. A two-bedroom apartment starts from €283 / person / week including ski pass. Skiing over the Easter week is going to be a huge success in Italy this season. Snow bases are good across the board and selected areas expect more in the next few days. The 3-star Chalet Al Foss in Vermiglio has a very nice free-ski deal for Easter week for you offering a double room with half-board and ski pass at just €482 / person. Vermiglio is only 7 km from the glacier ski resort Passo Tonale (70 km of runs) lift-connected to another 30 km in Ponte di Legno – Temu. Excellent skiing and breathtaking views guaranteed. If you prefer a bed & breakfast option we have a basic but nice 3-star hotel La Palu in Pinzolo Pay just €400 per person and get a free ski pass with access to the entire Pinzolo – Madonna di Campiglio – Folgarida-Marilleva skiing area. On balance, if you are after a free ski pass option, the area of Val di Sole is where the action is. The village is a tax-free zone for historical reasons. In the past taxes were paid to tax collectors, who travelled from place to place and collected them. To access Livigno tax collectors had to cross the high mountains which were often covered by snow. It turned out access to the village would often be not possible and taxes would be not collected. And so it stayed to date. For all of you, late season skiers we have two nice free ski deals in Livigno. If you travel just after Easter, this nice *** Garni Zodiac can be a good option. A double room costs €354 per person incl. breakfast and ski pass. For those planning skiing from April 18-25, apartment Natale in Livigno starting from €254 can be a good option. This entry was posted in Holidays in the Alps and tagged English by Michal Kuszynski. Bookmark the permalink.